I love the Avatar series and no I do not mean that James Cameron stuff! Korra is probably either my very favorite or my second favorite character in the two series set in the Avatar universe, and I absolutely love the way she’s drawn: muscular, broad, and strong. I love how the artist drew this; the paper texture is awesome with the color. I’d love to see a whole set of these. Maybe a tryptic. 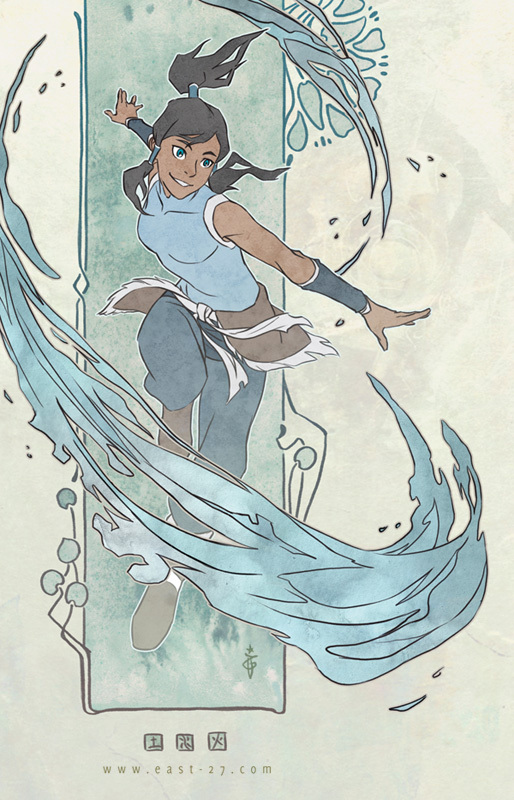 I love Korra and the way she is rendered, too. She’s got a lot of moxie. I dig that. But I think my favorite character would be Toph. I love Toph too. Sokka’s a close second, (gee, wonder why?) but Toph is the best. It makes perfect sense that you like Sokka, Craig.